4 October 1958 – The first regularly scheduled transatlantic passenger service with jet powered aircraft began when two British Overseas Airways Corporation (BOAC) de Havilland DH.106 Comet 4 airliners, civil registrations G-APDB and G-APDC, left nearly simultaneously from London Heathrow Airport (LHR) to Idlewild Airport (IDL), New York, and from New York to London. Delivery to BOAC at its Heathrow base on 30 September 1958 of its first De Havilland DH106 Comet 4 jet airliners. 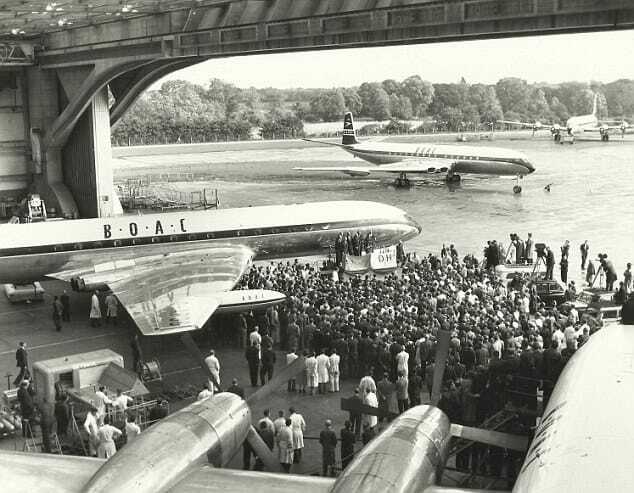 A few days later, on 4 October 1958, BOAC would operate the first ever-transatlantic passenger commercial services between London and New York. BOTTOM: A British Airways aircraft undergoing maintenance at the Heathrow Engineering base. Photocredit: British Airways, June 12, 2013. The west-to-east flight, (G-APDB) commanded by Captain Thomas Butler (Tom) Stoney, D.F.C., departed New York at 7:01 a.m., local time, with Basil Smallpiece, and Aubrey Burke, managing directors of BOAC and de Havilland, respectively, on board. Benefiting from more favorable winds, the eastbound flight took just 6 hours, 12 minutes, averaging 565 miles per hour (909 kilometers per hour). The east-to-west airliner, G-APDC, departed Heathrow at 8:45 a.m., London time,under the command of Captain R.E. Millichap, with Sir Gerard d’Erlanger, chairman of BOAC, and 31 passengers aboard. The westbound flight took 10 hours, 20 minutes, including a 1 hour, 10 minute fuel stop at Gander Airport (YQX), Newfoundland. Both airliners were configured to carry 48 passengers.